Is The Simpsons’ Moe based on that cranky New Jersey bartender from the "Tube Tapes"? 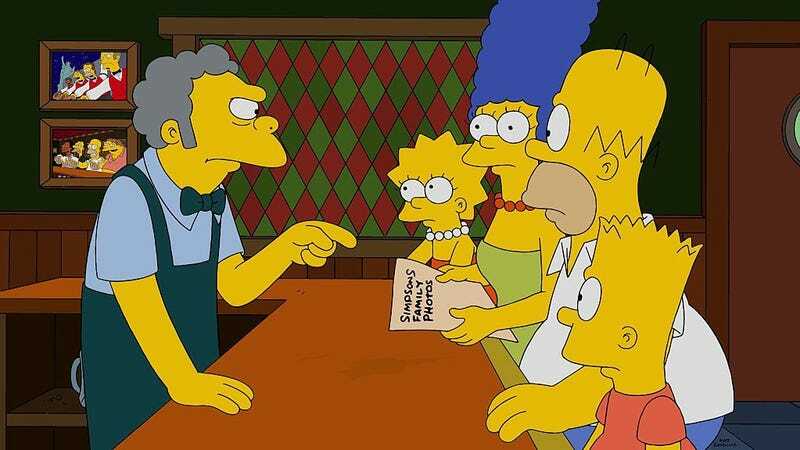 It’s no secret that some characters from The Simpsons are inspired by real people, but Moe Szylak, owner and operator of the eponymous Springfield bar, always seemed like an amalgam of archetypes rather than a direct imitation of any one person. But what if he’s actually just based on one cantankerous old bartender from New Jersey? A new article from Cracked resurrects the old theory that Moe’s character is inspired by Louis “Red” Deutsch, the gravel-throated bartender at Jersey City’s Tube Bar who was the victim of a series of prank calls in the 1970s. Back then, real-life Barts Jim Davidson and John Elmo repeatedly called Tube Bar and asked for classic pun names like “Al Coholic” and “Ben Dover.” It took a few tries for Deutsch to catch on but, once he did, he unloaded on the two youths with a series of threats and expletives that would have even made Moe blush. Eventually, tapes of the calls began to circulate and the “Tube Tapes” became a pre-internet viral hit, similar to the “Shut Up, Little Man” or “Farting Preacher” tapes. According to Cracked, bands like Metallica, Nirvana, and Alice In Chains were known fans of the tapes, which had begun to circulate without the knowledge of the original pranksters. In 1993, pop culture commenter Chris Gore directed a short film inspired by the “Tube Tapes” which starred Reservoir Dogs actor Lawrence Tierney (because that’s who we were all picturing in our head anyways). Simpsons creator Matt Groening has said in previous interviews that, while he was a fan of the tapes, any similarity to Moe is just a case of “creative synchronicity.” That’s a little difficult to believe considering the real life Red was a former boxer, just like Moe, and a handful of season one’s prank calls seem directly lifted from the “Tube Tapes.” But, hey, who’s to say? Maybe there’s thousands of cranky bartenders across America with similar stories. We should probably call them and find out.